Mohandas Karamchand Gandhi (2 October 1869 - 30 January 1948) was the preeminent leader of the Indian independence movement in British-ruled India. Gandhi led India to independence and inspired movements for civil rights and freedom across the world. The honorific Mahatma applied to him first in 1914 in South Africa. Now it is used worldwide. He is also called Bapu in India. He was born and raised in a Hindu merchant caste family in coastal Gujarat, western India and trained in law at the Inner Temple, London. Gandhi famously led Indians in challenging the British-imposed salt tax with the 400 km Dandi Salt March in 1930 and later in calling for the British to Quit India in 1942. 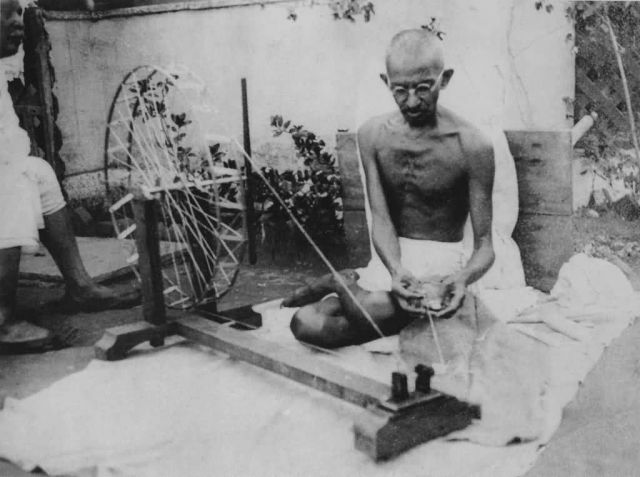 He lived modestly in a self-sufficient residential community and wore the traditional Indian dhoti and shawl, woven with yarn hand-spun on a charkha. He ate simple vegetarian food, and also undertook long fasts as a means of both self-purification and social protest. Indians widely describe Gandhi as the father of the nation. His birthday, 2 October, is commemorated as Gandhi Jayanti, a national holiday and world-wide as the International Day of Nonviolence.